Gypsum point, Tuzigoot National Monument. Click the image to open the Gypsum gallery. Geographical Range: The southern Great Basin south into northern Mexico and east into western Colorado and New Mexico. Date Range: 4500 – 1450 B.P. (Lyndon 2005). Size: Average: 32.4 mm long, 18.8 mm wide, and 5.9 mm thick; stem length: 13.4 mm (Lyndon 2005:Table 8). 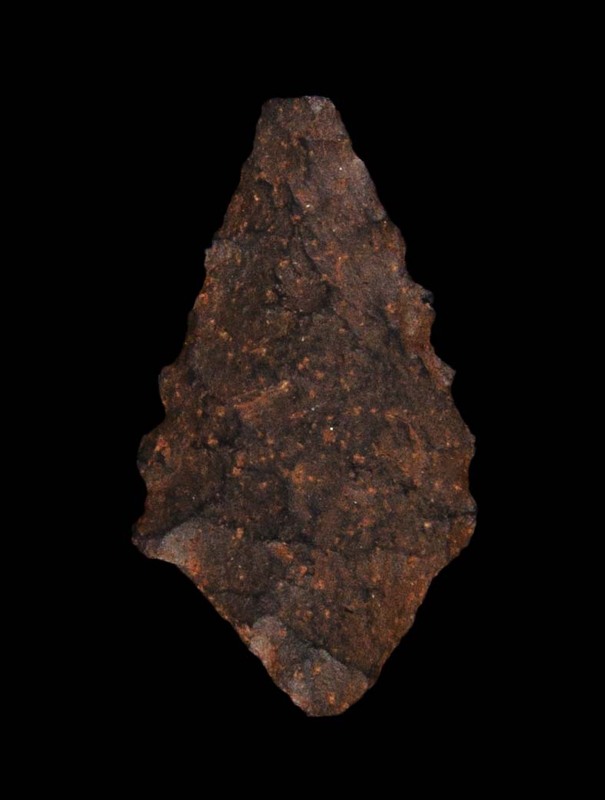 Shape: Triangular to diamond-shaped with a contracting stem; shouldered to tanged; sometimes serrated on the blade margins; frequently reworked. Other Names: Gypsum Cave, Augustin, Pelona, Elko Contracting Stem, Gatecliff Contracting Stem. Comparisons: There are similar, but geographically distinct types in southern California and in the Channel Islands.